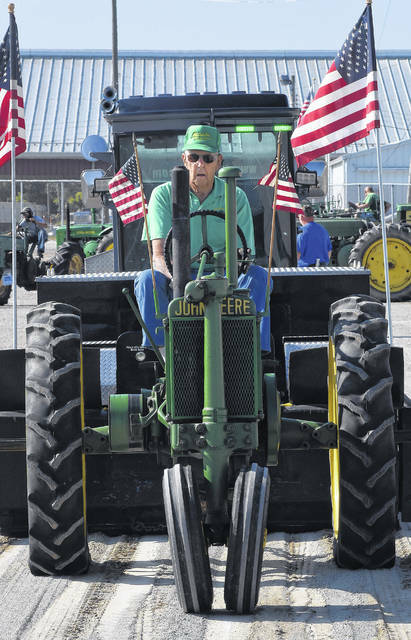 Mel Dawson, of Ada, competes in last year’s tractor pull with his 1936 John Deere Model A tractor to win in his division. 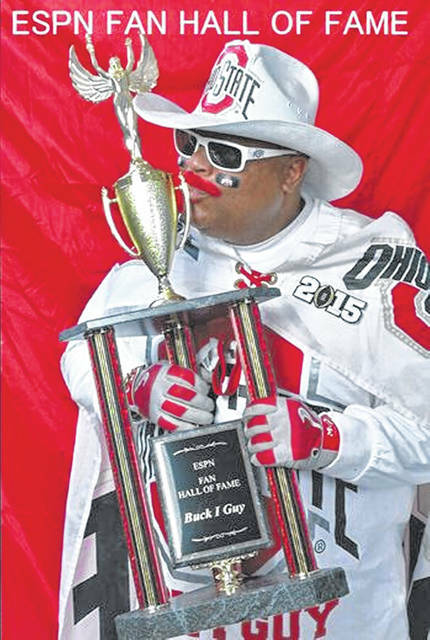 Buck-I-Guy will be greeting fans around the Allen County Fair this year. 8 a.m. Domestic & Applied Arts Judging - Ag & Fine Arts Bldg. 8:30 a.m. Antiques Judging – Ag. & Fine Arts Bldg. 9 a.m. All Other Sewing & Needle Arts Judging - Ag & Fine Arts Bldg. 11 a.m.-1 p.m. Canned & Baked Goods Exhibits due – Ag & Fine Arts Bldg. 2 p.m. Baked Goods Judging - Ag & Fine Arts Bldg. 6-9 p.m. Table Scapes (Classes 1-4) Exhibits due – Ag & Fine Arts Bldg. 6 p.m. Two Dimensional & Photography Judging - Ag & Fine Arts Bldg. 9 a.m. Open Class Table Scapes Judging (Classes 1-4) - Ag & Fine Arts Bldg. 10 a.m. Open Class Canned Goods Judging - Ag & Fine Arts Bldg. 2-9 p.m. Check-in time for All Other Junior Fair LIVESTOCK Exhibits - enter Gate 5 - St. Rt. 117 only. 3-8 p.m. Seeds, Grains, Hay, Vegetables, Fruits, Bees, Honey Exhibits due – Ag & Fine Arts Bldg. 9 a.m. - 12:30 p.m. Second Flower Show Exhibits Due – Youth Activities Bldg. 10 a.m. - 1 p.m. Table Scapes (5-9Y) Exhibits Due – Ag. & Fine Arts. Bldg. 11:-11:30 a.m. Wine Challenge Exhibits Due – Ag. & Fine Arts Bldg. 11 a.m. – Noon Favorite Chicken Casserole Exhibits Due – Ag. & Fine Arts Bldg. 1 p.m. Open Class Table Scapes Judging (Classes 5-9Y) - Ag & Fine Arts Bldg. ($2 Off Gate Admission with Can of Food - Walk in Gates Only 8 a.m. - 6 p.m.
11 a.m. Demo Days – Ag & Fine Arts Bldg. 9 a.m. - 12:30 p.m. Third Flower Show Exhibits Due – Youth Activities Bldg. 10 a.m. - 1 p.m. Table Scapes (10-14Y) Exhibits Due – Ag. & Fine Arts. Bldg. 1:30 p.m. Open Class Table Scapes Judging (Classes 10-14Y) - Ag & Fine Arts Bldg.